Managing a health system pharmacy in today’s complex regulatory environment can be a daunting task. Drug shortages, recalls, and unreliable medication availability are just a few of the concerns that must be addressed on a daily basis. Outsourcing compounded sterile preparations (CSPs) is a commonly utilized strategy to address product reliability issues. As reported in Pharmacy Purchasing & Products’ 2018 State of Pharmacy Compounding annual survey, three-quarters of all facilities now outsource at least some of their CSPs.1 However, the growing number of recalls from outsourcing operations has prompted some hospital pharmacies to rethink their overall outsourcing strategy. When considering 503B outsourced compounders, due diligence is critical to ensuring the manufacturer is compliant and produces high-quality CSPs. LDT Health Solutions, Inc (Wayne, New Jersey) maintains the largest database of FDA compounding activities and documents outside of the FDA itself (data is derived from published FDA documents [ie, Form 483]), and is able to routinely analyze this data to better understand the agency’s inspection focus, develop operational policies and procedures (P&Ps) to address these areas, and educate our clients (both 503As and 503Bs) to avoid any regulatory gaps. It is from this vantage point that we offer the following observations based upon FDA Form 483s, which, in some cases, pre-date the November 2013 establishment of the 503B program. Tracking trends in regulatory actions for 503B outsourced compounders can assist organizations in choosing appropriate 503B partners and in understanding FDA’s current inspection focus. Starting with the 2012 New England Compounding Center (NECC) nationwide fungal meningitis outbreak and continuing through July 22, 2018, the agency has published 562 inspection documents (FDA Form 483s) for 397 different establishments (both 503A and 503B) generated by 362 different FDA inspectors. For 503B compounders (outsourcing facilities) only, a pool of data is available from a total of 172 FDA inspections of 104 different facilities (this number exceeds the total number of 503B-registered facilities listed by FDA to account for establishments that have been closed or chosen to de-list as a 503B business), conducted by 199 different inspectors (see TABLE 1). TABLE 1 illustrates the depth and breadth of FDA inspections of 503Bs since 2012. On average, FDA spends 4-8 days on each inspection. It is important to note that the FDA is committed to inspecting each and every 503B facility; if a 503B has not yet been inspected, it should prepare now for the scrutiny of an inspection. Evaluating FDA Form 483s and warning letters issued to 503B establishments can be challenging, especially for pharmacists and other health care professionals unfamiliar with these documents. After careful review of the issued FDA document, it is important to obtain additional information from the 503B facility regarding its plan of correction in order to accurately evaluate the compounder’s current status. Ongoing monitoring of an outsourcing partner’s compliance with all prevailing statutes, rules, and regulations is not only essential, but a fiduciary responsibility of every organization that purchases CSPs from 503Bs. Thus, each organization must commit the time and resources required to obtain clarity from the provider any time citations are issued or other questions are raised. 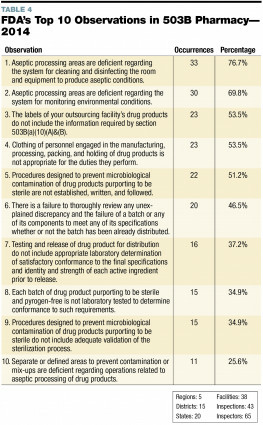 Analysis of FDA observations over time indicates a shifting inspection focus since the start of the 503B program (see TABLE 2). For example, the FDA focused on broad categories in 2012; however, in recent years, observations have become increasingly specific. 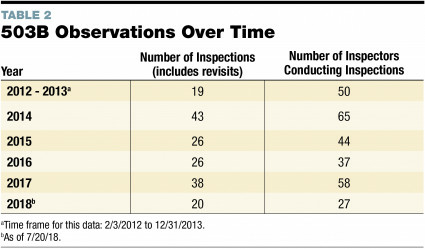 The number of inspections spiked in 2014 but has since levelled out. This may be due to the fact that the FDA is visiting an increasing number of 503A establishments. The number of inspectors is based on the reduced sizes of the inspection teams and the fact that the NECC team was so large it skewed the earlier data. In addition, note that the number of 503Bs has varied over time; currently, seventy-three 503Bs are listed, and 52 that were registered have dropped out. Some of the 503Bs that dropped out account for multiple inspections. 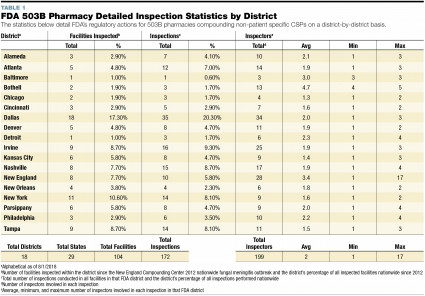 The top ten observations included in the released FDA Form 483s for 503Bs indicate that the most frequent citations in 2012-2013 were similar to citations issued to 503A pharmacies. These observations focus on a lack of written P&Ps; shortfalls in release and quality testing; and gowning, gloving, and garbing inadequacies. TABLE 3 lists the most frequent 503B citations in 2012-2013. In 2014, FDA’s focus shifted to the physical plant and the compounding spaces producing CSPs, including CSP labeling, the testing and interpretation of quality data surrounding these CSPs, as well as gowning, gloving, and garbing inadequacies. TABLE 4 details the most frequently cited 503B citations in 2014. With 2015 came an increasingly technical focus, including citations regarding the areas of quality documentation and product labeling. From 2015 to the present, FDA has continued to inspect for specific activities; more precisely, the agency is routinely citing section 503B(a)(10)(A) and (B) with respect to CSP labels. In addition, there have been a proliferation of citations that should have been controlled by the 503B’s quality control unit (as defined in the Code of Federal Regulations). In pharmacy, the pharmacist in charge is responsible for CSP quality; in 503Bs, the quality unit is responsible. Examples of citations that should have been controlled by the quality control unit include rejecting an in-bound API, rejecting drugs and materials that do not meet specifications, and early launching of recalls or preparation withdrawals. TABLE 5 shows the most frequently cited 503B citations from 2015. 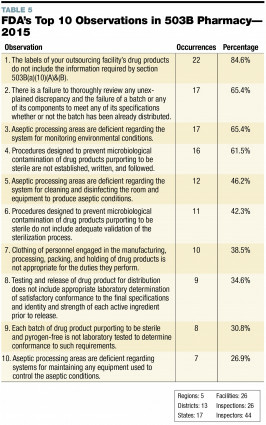 Per this adjustment, the observations cited have become more consistent; within the time period of 2016 to the present, the following observations have been consistently noted: lack of proper product labeling; lack of P&Ps established, written, and followed; and aseptic processing areas deficient for monitoring environmental conditions and for the systems for cleaning and disinfecting the rooms and equipment to produce aseptic conditions. TABLE 6 includes the most frequently cited areas from 2016 to the present. 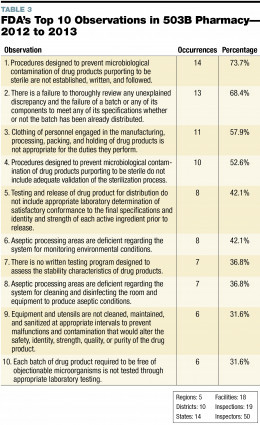 Because not every FDA inspection document is publicly released (for a wide range of reasons), lessons learned from this article must be tempered with the understanding that multiple factors are involved in each inspection, and that the trending data presented herein is a broad brush of the field activities currently ongoing at 503B outsourcing facilities. Even so, lessons learned by examining the entire group of 483s presented here can provide important insight into a provider or prospective provider’s level of compliance. Repeated citations over time at any single facility may indicate a lack of focus by its leadership on corrective actions, while citations for apparently simple items, such as package labeling, could indicate a basic lack of understanding of regulations. In either case, citations should trigger a ramping up of due diligence and monitoring of your 503B provider’s quality management activities. When questioning a 503B provider, be direct and demand confirmatory documentation of any remedial or corrective actions taken. Continuous follow-up is critical to ensuring that these corrections have become part of the outsourcer’s daily practices. Establishing regular verbal and written reporting from the provider’s operations team is an excellent first step. If you are dissatisfied with a provider’s standard reports, be specific as to the key quality indicators you seek. Once the proper reports are in place, be sure to regularly review the information to ensure the CSPs provided for your patients are safe and effective. Gaining broad insight into the patterns of FDA activity surrounding 503B providers can yield benefits beyond creating a simple report card for your outsourced compounder. A thorough understanding of the quality efforts or weaknesses in a 503B outsourcing provider can help an organization choose a 503B partner. Moreover, understanding FDA’s current areas of focus, as well as regular review of an organization’s 503B providers, can help ensure pharmacy is taking every step possible to ensure patients are receiving safe, effective CSPs. 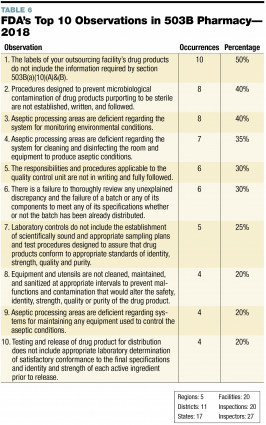 State of Pharmacy Compounding Annual Survey. Outsourced Compounding. Pharm Purch Prod. 2018;15(4):S40-S44. Diorio L, Thomas D. Evaluating 503B outsourcing providers. Pharm Purch Prod. 2017;14(2):10-14. US FDA. Regulatory Information. Guidance for Industry: Enforcement Policy Concerning Certain Prior Notice Requirements. www.fda.gov/RegulatoryInformation/Guidances/ucm261080.htm. Accessed August 6, 2018. Lou Diorio, RPh, FAPhA, is a principal of LDT Health Solutions, Inc, an international medication safety and quality management consulting company celebrating its 10th year of practice. Lou is a graduate of Long Island University’s Schwartz College of Pharmacy, where he is also an adjunct professor of pharmacy practice, a member of the college’s Alumni Board, and preceptor of pharmacy students. He serves as a member of the New York State Council of Health-System Pharmacists’ Research and Education Committee and also is a member of the New Jersey Society of Health-System Pharmacists’ Industry Relations Committee.